Reading the break of a putt is like solving a crime. The more information you have, the more likely you are to crack the case. There are 5 steps in the process of producing a Pocket Guide. The 1st of the Green Mapping Steps involves obtaining a diagram of each of the 18 greens on which to map how your ball will break at different locations. The best diagram is the original architect's drawing as this will show not only the shape and size of the green, but also the different contour lines. The next best is the diagram of each green from an Official Yardage Book that the course has commissioned to sell to the public. 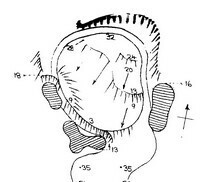 This depiction of the green will not provide as much information as the architect's drawing, but it is good enough for the purposes of preparing your own Pocket Guide. Another source of information is a hand-held GPS device that shows yardages, fairway views, hazards, as well as the shape and depth of each green. If nothing is available, or a GPS device is too expensive, you can still get the shape of the greens from the satellite image provided free by Google Earth. Unless your course is close to a sensitive military location, you should be able to identify the greens and estimate their size. You can still print out an image for each green and then enlarge and enhance the outer border. This is how I originally created the Yardage Books for a regional Mini-tour. The 2nd of the Green Mapping Steps involves identifying the different putting zones in which the hole can be cut on the green. For example, some greens have a false front that can't be used for a pin location. Most golf superintendents use a standard system whereby they balance the left and right sides of the green as well as the back, middle, and front. This prevents wear and tear and presents the golfer with a different challenge each day. 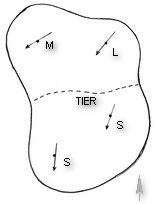 Golfers are often given a diagram of the weekly pin rotation to identify the day's pin position. This is especially useful for blind or raised greens when it is not possible either to see the green or the bottom of the flag. It is also useful for you in the preparation of your own Pocket Guide as each zone represents an area where you will need to know something about how your ball will break. The 3rd of the Green Mapping Steps involves identifying the most probable locations where the hole can be cut. Old hole plugs show where the hole was previously located. However, if you play regularly at a course you will learn over time the different pin locations for each green. Not every part of the green will be available for a fair pin location. Architects try to design greens with the maximum number of possible pin locations. However, faster green speeds have eliminated certain pin locations as the slope is now too severe to allow the ball to stop near the hole. On tour the site of possible pin locations is well known. They are usually in the same place each year tucked behind bunkers and close to hazards and ridges. The 4th of the Green Mapping Steps involves the detailed mapping of the different breaks on the green. For professionals the Tour Yardage Book goes some way to providing the information of the green contours and the direction of the breaks. This is the type of information you will need to gather for yourself. You can use a simple aid such as the Fall Line Putt Reader to get your readings. 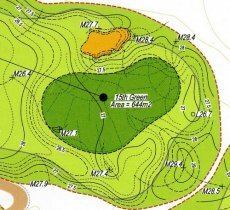 You want to mark on your Green Map the local fall line at each possible pin location and the degree of slope. You will normally find that the direction of the break is fairly consistent in each zone. To keep your map from getting cluttered with too many directional arrows in the same area, just mark one arrow to show the direction and the degree of slope. The 5th and final Green Mapping Step is preparing a Pocket Guide so you can refer to it out on the course before you putt. You will now know beforehand how severe the slope is and how your ball will break at the hole. Most slopes at fair pin locations fall in the range of 1 degree (1.75%) to 3 degrees (5.24%). You can use a numerical system or simply mark them as Steep, Medium, and Low. Based on your knowledge of the green speed for the day you will be in a better position to judge the path you show take for your putt. Because every putt is a combination of path and pace there is no guarantee that you will hole the putt. However, you should seldom experience the regular surprise of golfers when their ball breaks in the opposite direction to what they thought.